Zaza makes up to 30 kvevris of varying sizes each year, all by special order for both Georgian and European vintners. 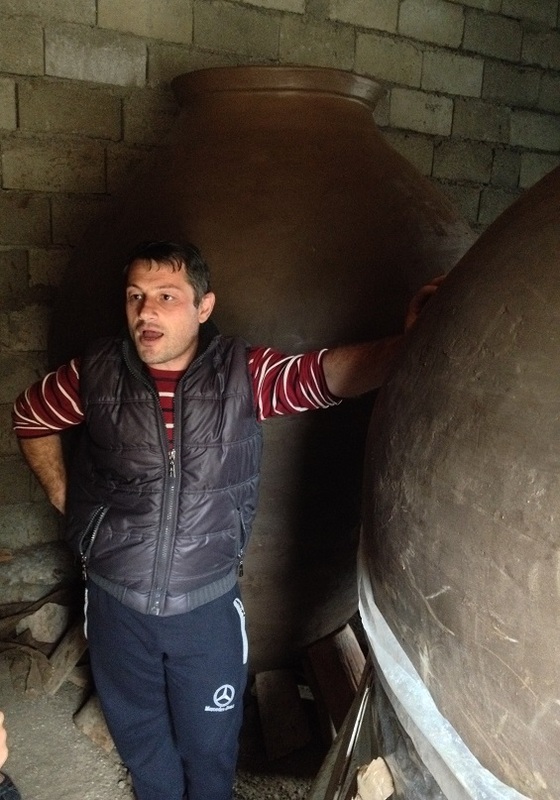 There are eight huge unfired kvevris drying in his workshop when we visit. He stands next to one of them, which dwarfs him, as he tells us about the process. These kvevris took him three months to make. The clay goes on in eight layers, from the conical bottom up to the lip at the top. He uses a potters’ wheel to form the pointed base so that the kvevri will be stable and even, but layers on the clay by hand after that. Once the clay has dried sufficiently (which may take a couple of months, give or take: “When you are meant for this work, the kvevri itself tells you what it needs and when it’s done,” Zaza says), the kvevris are loaded one by one onto a horsecart and carried into the firing “room,” a three-sided brick structure out in the backyard. The fourth wall is then built up with bricks and a wood fire is made just in front of it. The firing process takes a full week and requires three truckloads of wood to keep the fire going constantly. It grows in size and heat over the course of the course of the week. 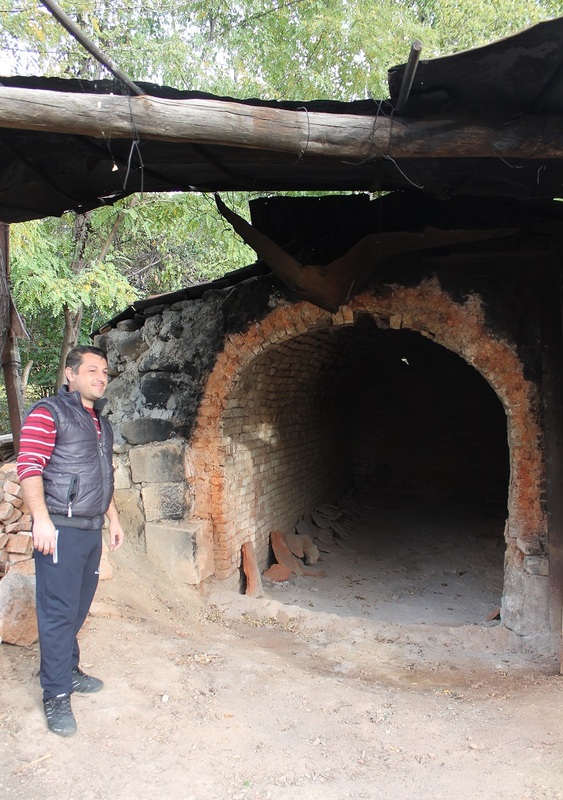 By the end of the seventh day, the temperature inside the “kiln” has grown to approximately 2,200 degrees F (1,200 degrees C) and flames spit out from the vents in the back of the firing room. The fired kvevris cool over the course of two days, as the fourth wall of the firing room is gradually dismantled. 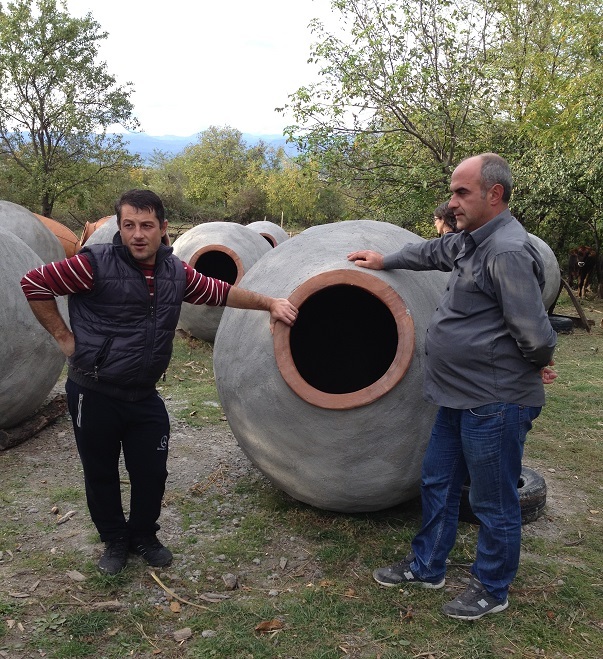 The kvevri maker coats the inside of each one with a layer of beeswax while the clay is still warm enough to absorb it. This seals the clay and helps prevent bacteria from entering the wine during fermentation and storage. Finally, most qvevris are coated with a thin layer of cement to protect them from indignities they may suffer once they are buried underground, like earthquakes and encroaching tree roots. A group of European filmmakers visited Zaza shortly before we did to capture parts of this process for a documentary they are working on about kvevri wine in Georgia. See photos from their visit here. You can follow the film on Facebook for updates on its progress and related stories.